The Taco Shop is a fun little place painted warmly yellow down the back of Leftbank, cozy and humming, and seating all of about 15 people (although one can sit at the tables just outside if the weather behaves). The menu has a picture of Frida Kahlo on the front and the Madonna on the back, and is delightfully hand scripted inside. The offerings are simple – 3 entrees, mains covering the usual quesadillas, tacos, tortillas, salads and tortas (mexican sandwiches), one dessert (chocolate brownie) and 4 breakfasts (all variations of eggs, beans and tortillas). 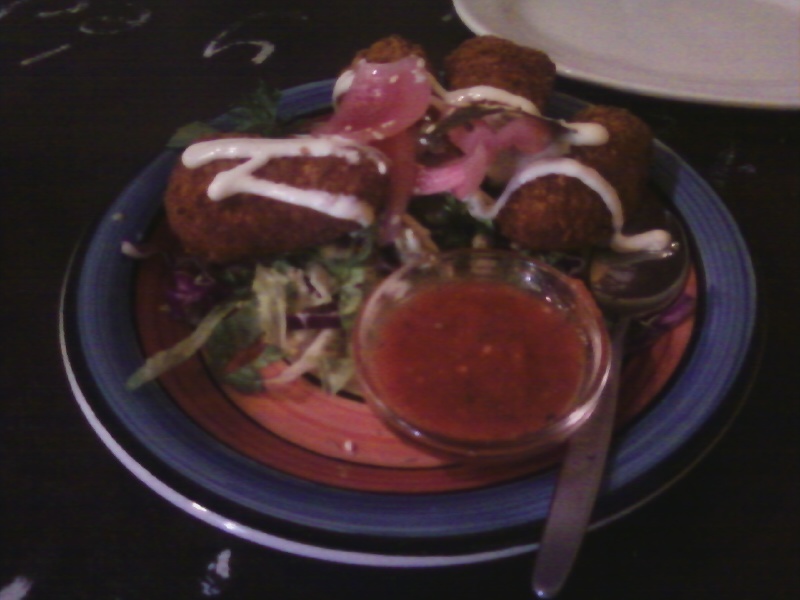 Our entree of cheese stuffed jalapenos was very tasty and unexpectedly (to me anyway) crisply crumbed. Something about the cheese was different than expected (thinner and silky) and pleasing to the taste, but I never did quite put my finger on what. The mains of a ‘wet’ taco (tortillas with a sauce of choice poured over – orange tanged pibil in this case) and ham quesadilla were both very pleasant and available in small or large sizes. The plates were a colourful backdrop to the food, the beer Mexican, the service welcoming and prompt, and overseeing our dining pleasure a large wall mural in memory of Emiliano Zapata (early 1900 Mexican revolutionary) which made for interesting reading while digesting. The meals are very good value for money and one could easily slide in and out here for a quick pleasant meal on the way home, or a more leisurely catchup with friends.